I was going to stop doing these monthly blog updates of William when he turned a year old but I miss them. It's been fun to go back and read what he was doing each month. So, here's 13 months. - wakes up in the morning and yells, "Dada!" over and over. He loves his old man. - gained three pounds in one month. Yahoo! He's become rather chubby and it's ultra cute. - doesn't just walk. He runs. Everywhere. - found out that his kisses makes his mom really happy. When I'm at his level (on the floor or sitting on the couch) he'll stop his play to run over to me just to give me a slobbery kiss and then he's on his way until he comes back for another smooch. It makes my heart swell three times. - has learned the act of toddler screaming. Sigh. Any tips you might have on ceasing and desisting this act, please share. - refuses to sign the things I taught him - milk, more, please, all done, thank you - even though I know he can do them. See above. - loves Little Bear, Thomas and Friends, William's Wish Wellingtons and Kipper (so maybe we love shows from the UK). - looks like a big boy with his new haircut but I'm pleased to see that the curls are growing back. - enjoys following me around the house all day and has even learned to help out a bit (like putting toys away). - finally loves bananas. I was afraid he wasn't a normal boy but it's fine now. We dodged a bullet there, folks. I love my boy more and more every day. With everything going on this last month I especially found myself soaking in the love I have for him. The moments when he cries at my feet to be held while I do the dishes is really frustrating sometimes, but this month I've thought about how I should hold him as if it's the last time I'll ever be able to. I know it sounds cheesy and even a little unrealistic but I guess losing this baby has made me grasp onto the one I have. Yes, keep the updates coming! Toddler kisses are the best! He is at the FUNNEST age. I'm glad you get to enjoy it. Signing is great for those who can't communicate verbally, but don't stress about it. It obviously doesn't feel natural for him, so don't push it. Encourage him to try and use his voice instead. 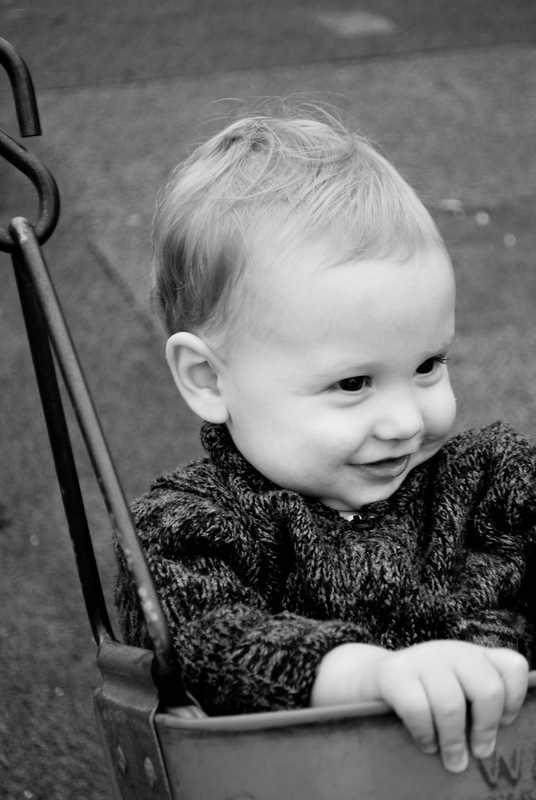 Simply beautiful picture of your little one!